In case you didn't know—It's December 12, 2012. For those of you that dig numbers, that makes it 12-12-12. Obviously it's the only time this year that the numbers align, unless you count January 2. (Cool, but not AS cool as today's date, right?) So let's have some fun. I put together the following no-equipment workout. The moves are simple so you can keep proper form throughout. 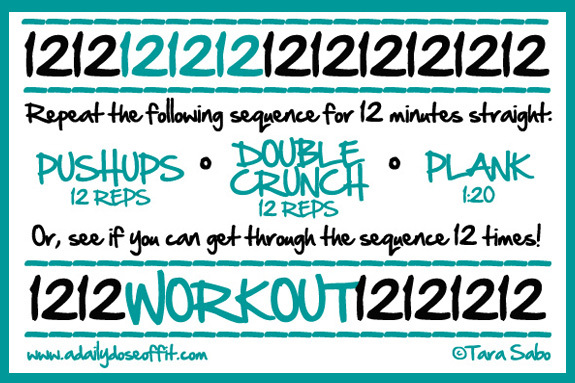 See how many repetitions of the sequence you can do in 12 minutes, or go through it 12 times. Question: What's the most important number in your life? Do you have a "lucky" number? Tell me.